An online course for beginners who want to accelerate their learning and develop their freestyle skills to the next level. Do you want to improve your ball control? Do you want to learn cool tricks and impress your friends? Are you a freestyle enthusiast but struggle with the basics? If the answer is YES! to any of the questions above then I have something special for you. Fundamental Freestyle is an online course for beginners who are looking to improve their ball control and freestyle skills. This course has been designed to give a complete and fun introduction to freestyle, providing the most essential tricks and techniques that will serve you throughout your freestyle career. Packed with video tutorials, training guides, printable progress trackers, fun challenges and training tips. Fundamental Freestyle will give you everything you need to learn at your own pace and get the results you desire! Want to be notified when the course launches? Drop your email address to find out first. 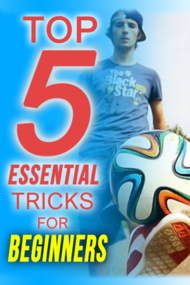 You'll get a free beginners e-book so you can learn straight away. You'll also be notified of new tutorials that are uploaded to YouTube and receive regular training tips and advice. © Copyright 2019 learn2freestyle. All rights reserved.